“Alright, that’s time,” Morgan Palmer yells out over the excited children. This cues the two volunteers, both elderly women, who begin to tug up the net. 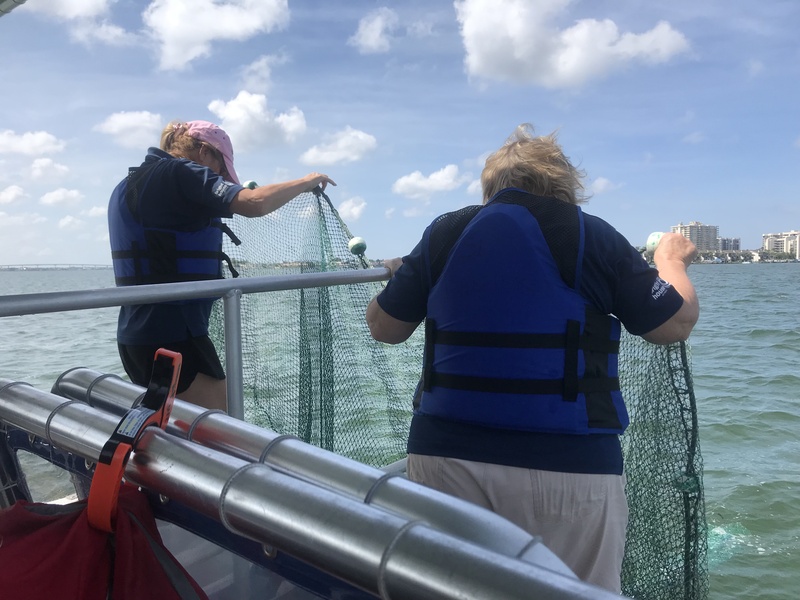 A 10-foot net waves through the water as it is dragged up from the bay, a surprise every time as the bottom of the net reveals creatures of all shapes and sizes. Palmer, senior marine life and environmental educator at Clearwater Marine Aquarium, is leading today’s 10 a.m. Sea Life Safari Boat Tour. “Nets up!” yells Palmer as she joins the volunteers in pulling up the net. Little by little the crowd watches with anticipation as it snakes its way to the deck. This blue boat, about 20 feet by 5 feet is stalled, gently bobbing while they proceed to plop the net into a cooler where the fish swim anxiously as the kids gather around wide eyed. Taking one quick glance, almost machine like, it’s only a matter of seconds until Palmer has the fish all sorted into separate containers. She identifies them as pin, mojarra, catfish and lizard fish. All but one unfortunate fish were now swimming along their tank, exploring their new surroundings. A baby catfish had wedged itself into the netting causing itself to get stuck, his slender black body just slightly rounder than the hole of the net. “Someone grab me gloves,” Palmer yells out. She was competing now with the water crashing against the boat and the kids, who now were directly at her side peering into the tanks. Grabbing the gloves handed to her by one of the volunteers, she begins carefully pulling the net away while she maneuvers the fish. As she does this I hear her talking gently to him. She is trying her best to soothe him so that his little body would relax. His struggling is only making his situation worse. Thirty seconds ticks by, which must seem like minutes to this little guy, and finally we see progress. A few more seconds and Palmer finally detaches the baby catfish, her face flooded with relief. Tossing him back into the water, she turns towards me, explaining that catfish are usually released quicker than any other fish becuase they stress themselves out. Every boat tour is unique, since you can’t exactly predict what is going to swim its way into your net. Today’s star was the lizard fish, catching the kids’ attention by its size. At about eight inches long and two inches wide, he resembles an eel. His brown and white speckled spots catch in the sun and send reflections dancing above him in his tank. Once all the fish are up and sorted, this is where the research begins. The aquarium sends out a set number of boats daily to collect data. The number of boats sent out depends upon the weather as well as the current season. The boat has different set spots that they pull their data from in which they cycle through as Alexandra Pluim, volunteer, explains is to make sure that one spot doesn’t get too depleted. “If we were to continually pull from the same spot every day, than that spot would essentially die,” said Pluim. “We need to allow that particular ecosystem at least five days to replenish and repair itself since we do not release the fish back in the same exact spot. Recording the quantities of species they find in certain areas of the bay allows them to regulate the health of that particular ecosystem. This can show us if there is an issue or can allow us to see what damage was done after a hurricane or any major storm. Rescue, rehabilitation, and release, that is the mission at the Clearwater Marine Aquarium. The mantra stems from this non-profit organization as they strive to get the public to understand how irreplaceable the value of the ocean is. The most well-known success from this aquarium was actually made into a movie, Dolphin Tale, telling the story of Winter. Winter had found herself caught in a crab trap, stranded in Mosquito Lagoon, near Cape Canaveral, Florida. A majority of the time dolphins cannot survive this, however, at only two months old Winter held on while she was transported to the aquarium. Unfortunately, with all the damage done to her tail, it had deteriorated and nothing could be done to save it. She learned to regain her strength using a prosthetic tail after hers was amputated. Now, when you walk into the aquarium she is the first thing you’re able to see. Today, I watched her hit a ball around with her snout in her tank happily playing. She has to feel every one’s eyes on her and I’m convinced she is soaking up all the attention. She was putting on a show for all of us standing here. A majority of us leaned over the guardrail to get as close as possible to this prodigy, until the tall, slender male in the blue shirt kindly tells us we need to take a step back. Winter proves you can defy all odds with hard work. She splashes by the edge of the tank showing us as she swims around, with only a nub to show where her tail once was. “Honestly, it was the first Dolphin Tale movie that had come out when I was still in high school that made me realize that this is something I want to do,” Palmer said. Prior to getting involved in the academic side at the aquarium, Palmer was involved in rescue. However, after a year Palmer had switched over to education. Growing up in Indiana and getting her bachelor’s degree there, she was never able to get hands on experience with the ocean as she does now. “I’d really like to go back to Indiana and get my master’s degree so I can teach this marine biology field to those who didn’t have the opportunity like I did, to move down here to Florida,” Palmer said. As Palmer loads onto her boat every day, net ready, to share her knowledge on the mysterious ways of the sea she also inspires those around her. Not only kids, but those aspiring to hold a position in the education of marine life, such as Pluim.